1B Umpire Jerry Meals ejected Yankees Manager Aaron Boone (dead ball strike three call by HP Umpire Ed Hickox) in the top of the 6th inning of the Yankees-Indians game. With none out and none on, Yankees batter Giancarlo Stanton swung at a 0-2 fastball from Indians pitcher Steve Clevinger, resulting in a dead ball third strike ruling by HP Umpire Hickox, who ruled that Stanton made contact with the pitched ball as he attempted to strike it. Replays indicate Stanton's hands made contact with the ball during his swing and that the bat did not make contact with the ball prior to this event; by rule, this is a strike, the call was correct. * At the time of the ejection, the Yankees were leading, 3-2. The Yankees ultimately won the contest, 5-4. This is Jerry Meals (41)'s second ejection of 2018. Jerry Meals now has 0 points in the UEFL Standings (-3 Prev + 2 MLB + 1 Correct Call-Crewmate = 0). Crew Chief Jerry Meals now has 4 points in Crew Division (3 Previous + 1 Correct Call = 4). *OBR Definition of Terms: "A STRIKE is a legal pitch when so called by the umpire, which: (e) Touches the batter as he strikes at it." *OBR 5.09(a)(6): "A batter is out when—He attempts to hit a third strike and the ball touches him." This is the 96th ejection report of the 2018 MLB regular season. This is the 41st Manager ejection of 2018. 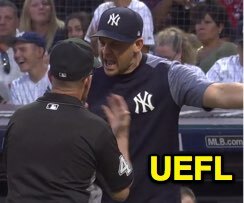 This is New York-AL's 7th ejection of 2018, 1st in the AL East (NYY 7; TOR 5; BAL 3; BOS 2; TB 1). This is Aaron Boone's 2nd ejection of 2018, 1st since May 22 (Pat Hoberg; QOC = Y [Balls/Strikes]). This is Jerry Meals' 2nd ejection of 2018, 1st since April 1 (Marwin Gonzalez; QOC = U [USC-NEC]).